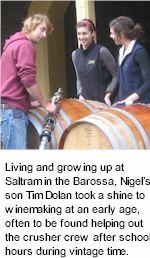 Nigel Dolan of Saltram and Pepperjack fame established his own estate with a clear vision to produce distinctive, flagship Barossa wines. His forebears Arthur and Thomas Dolan planted the family's original 88 acres of vine in 1895. Nigel's father Bryan worked at Hardy, Saltram and Stonyfell, where he appointed a young Peter Lehmann as his replacement. Bryan is best known for establishing the Pepperjack label and winning the inaugural Jimmy Watson Trophy. Nigel is a Baron of the Barossa, has won the Jimmy Watson twice and Stodart Trophy three times. Dense and dark, vibrant ruby colour. Black fruit aromas dominate with mulberry, plum and fig characters over notes of licorice and smoked meat. The palate has deep layers of dark fruits and black cherry with a brambly, slightly tarry edge. A silky soft mouth feel that's underlaid by a tight drying tannin backbone giving the wine structure and a degree of elegance.